Insulin pens are designed to withstand a lot of use but as with any product, can become damaged or faulty. If you think a fault may have developed in your insulin pen, your health team should be able to help to give you advice. Note that some of these occurrences may or may not be an indication of a fault with the insulin pen itself. For example, if a needle is not screwing onto the pen properly, this could be a fault with either the needle or the relevant part of the insulin pen. If insulin is not being delivered correctly, the fault could be in either the needle or the insulin pen. Where appropriate, it may help to change the needle and see if the fault remains. 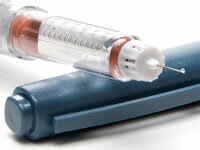 If insulin is not being delivered when the dose button is pressed, check whether excess air in the insulin cartridge could be causing the problem. If you have a fault with your insulin pen or the delivery of insulin in another way, contact your health team for advice. If your health centre is closed, call your local out of hours service. My blood glucose levels have been high for the last few days, is my insulin pen broken? As there are a number of reasons to explain why your sugar levels may be high, it’s best to seek help from your health team if your blood glucose levels have become high without a clear reason.